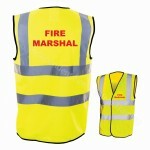 High visibility vest available with Fire Warden or Fire Marshal wording. 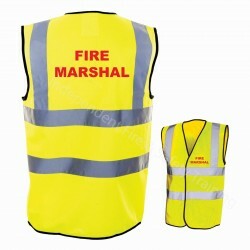 A garment that clearly identifies nominated individuals during a fire emergency or undertaking routine fire prevention duties. XXLarge = 46"- 48", 3XLarge = 50"- 52", 4XLarge = 52"- 54". 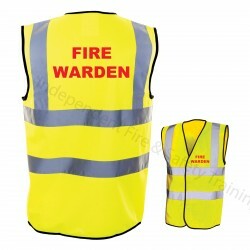 Small 38"-40" Medium 40"-42" Large 42"-44" XLarge 44"-46" XXLarge 46"-48" 3XLarge 50"-52" 4XLarge 52"-54"